SAGITA COM - onOne Perfect Photo Suite dirancang untuk membawa gambar Anda untuk hidup dan membuatnya terlihat terbaik. Buat gambar yang luar biasa, menginspirasi kreativitas Anda, dan memecahkan masalah foto yang paling umum. Anda akan memiliki semua yang Anda butuhkan untuk meningkatkan, retouch dan menyesuaikan dgn mode gambar, mengganti latar belakang, dan membuat pembesaran berkualitas tinggi. Perfect Photo Suite is designed for every photographer, whether you are an avid enthusiast, a working professional, or someone in between. Make your images extraordinary with the best effects available today. Apply the basic adjustments that almost every image needs to go from good to great. Focus on the art of portrait creation because the most time consuming retouching tasks are automated in the Portrait module.The Resize module gives you everything you need to prepare your images for print. Develop stunning images that recreate the timeless look of black and white master photographers. Quickly get to your images wherever they're stored-whether they’re on your computer, network, or on a cloud-based storage service. 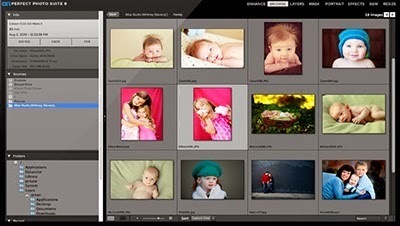 Combine and blend images without Adobe Photoshop. Create high-quality masks with state-of-the-art tools that help you select subjects and isolate backgrounds for removal-even around hair and trees and through glass and veils, and many more.